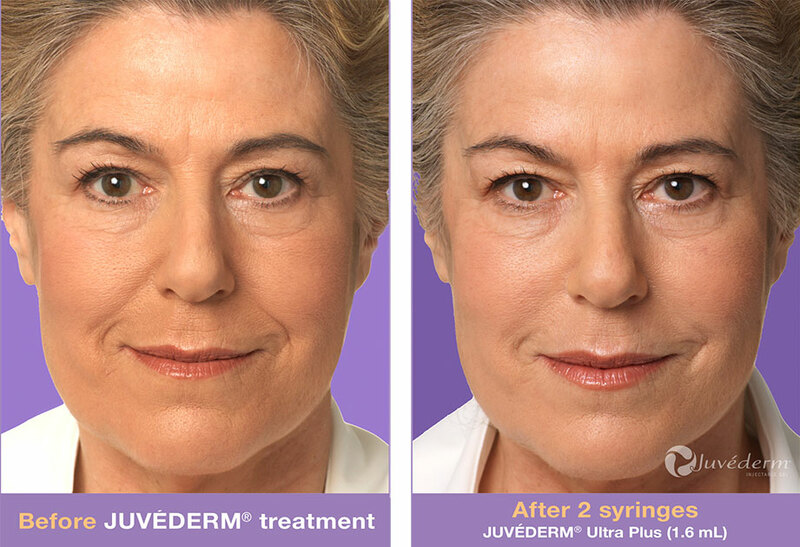 JUVÉDERM® is a hyaluronic acid filler that is used to replace volume lost through the normal aging process. Hyaluronic acid (HA) is a natural hydrating component of skin that binds and holds water in order to maintain volume in the face. As we age we lose hyaluronic acid and collagen in our skin tissues which causes thinning of the skin, loss of volume, and deflation of the facial tissues. This facial deflation causes hollowed or sunken areas in the face that contributes to an aged appearance. JUVÉDERM® is biocompatible dermal filler that replaces this volume in the affected areas and also helps to fill in deeper wrinkles. JUVÉDERM® is used to replace volume throughout the entire face. It is most commonly used along the nasolabial folds, or parentheses lines around the mouth; the marionette lines of the lower mouth; the pre jowl sulcus; as well as the upper and lower lip to enhance volume. It is also commonly used to re-inflate the cheeks and the temporal region for a more youthful appearance. Your comfort is of utmost importance at Richmond Aesthetic Surgery so we ask you arrive thirty minutes prior to your procedure for a topical anesthetic to be placed along the treated areas. This will help to keep your discomfort to a minimum during the procedure. JUVÉDERM® XC is also premixed with lidocaine to ensure further comfort. Next, the JUVÉDERM® is injected into the soft tissue of the dermis using a very small needle and then manually massaged to ensure the smoothest results. An icepack is then immediately applied to reduce bruising. The entire process takes approximately 30 minutes to 1 hour. The most common side effect after JUVÉDERM® injections is bruising along the injected areas. Not everyone bruises but people who take blood thinners such as aspirin or ibuprofen are at increased risk. Other rare injection site reactions can occur, such as redness, tenderness, and swelling. Because hyaluronic acid is a natural component in the skin there is little to no chance of allergic reaction and allergy skin testing is not required.